The national committees of the major political parties in the United States are symbols of party government. They carry forward a national heritage of peaceful change in national politics and administration. National committees are substitutes for party ideologies, yet they are pretty much headless, drifting organizations. Cotter and Hennessy explain why this is the case, arguing that the vagueness of the committees' responsibilities between presidential elections is one of the main sources of their limitations. 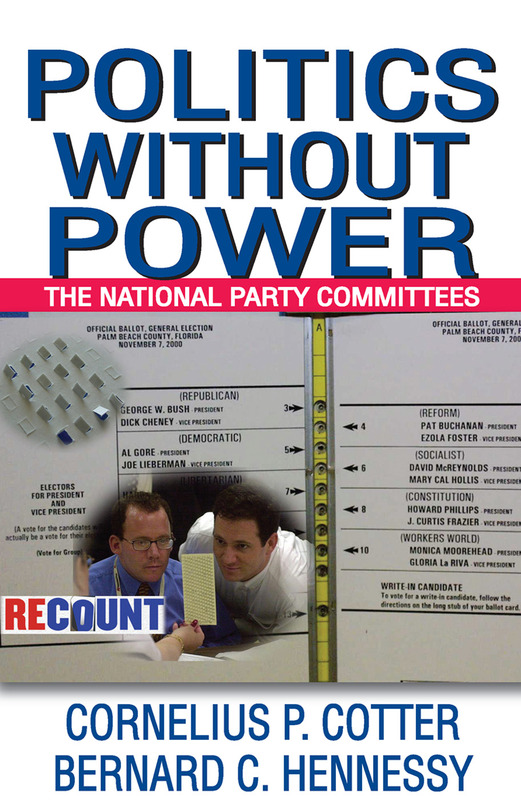 Politics without Power explains what the national committees are, who belongs to them, where they are located in relation to other politically oriented organizations, what they do, and what steps might be taken to make better use of them. Although the authors' descriptions in this classic volume are straightforward, their recommendations are sweepingly bold. A few have been instituted in part, but most have yet to be adopted. If they were, it would completely change the makeup of the two committees and the political processes. Among their proposals are that the offi ces of national committeeman and committeewoman should be abolished, that the national chairman of the in-party continue to be chosen by the president or candidate, and the national chairman of the out-party be the titular head of that committee. The out-party should have a party council to interpret the platform and to recommend a platform to the national convention. There should be a tax credit for small contributions to the national committee or state committees, and each national committee would have its own building shared with the Congressional Campaign Committees. This book will interest political scientists, politicians, and other students of American politics and elections. What Are the National Party Committees?